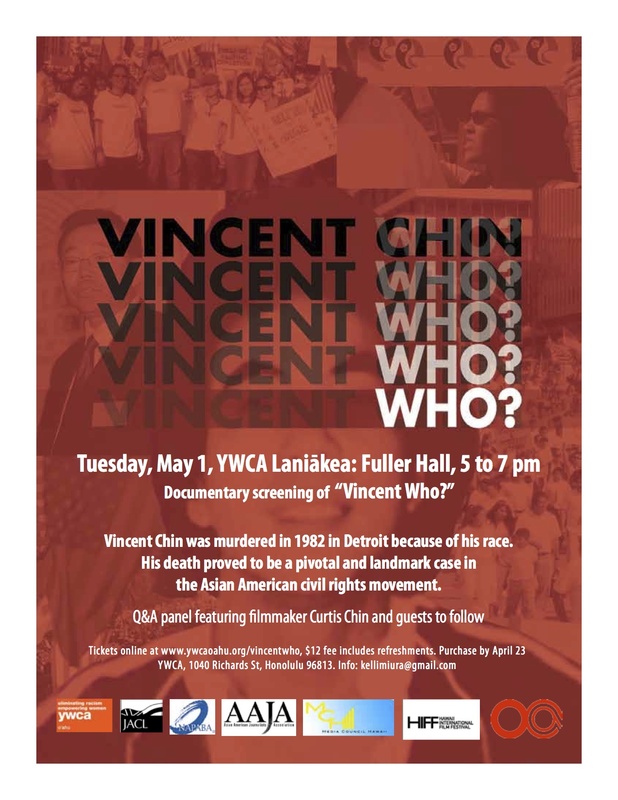 HONOLULU – On Tuesday, May 1, the Asian American Journalists Association (AAJA) Hawaii chapter and other local organizations will present a screening of the award-winning documentary film Vincent Who? at the YWCA Laniakea (1040 Richards St.). This collaborative effort aims to provide the public with an educational opportunity to learn about an important case in American civil rights history. The screening will be held from 5 to 7 p.m. in Fuller Hall. Immediately following the film, attendees will be treated to a panel discussion featuring filmmaker Curtis Chin, civil rights expert and attorney Mari Matsuda, community organizer and attorney Hoyt Zia, and YWCA of Oahu CEO Kimberly Miyazawa Frank. Vincent Who? tells the story of a Chinese-American who was murdered in 1982 by two white autoworkers in Detroit. The incident took place at the height of anti-Japanese sentiment because of the massive layoffs in the auto industry. The killers were ordered to pay a $3,000 fine and were sentenced to three years probation, but no jail time. This injustice sparked a pan-Asian identity and civil rights movement across the U.S. Organized by the AAJA Hawaii Chapter, this event was made possible by the Hawaii International Film Festival (HIFF), Japanese American Citizens League Honolulu Chapter (JACL), Media Council Hawaii (MCH), National Asian Pacific American Bar Association (NAPABA Hawaii), Organization of Chinese Americans (OCA) Hawaii, and the YWCA of O’ahu. The public and media are invited to attend. For more event information and registration, please visit www.ywcaoahu.org/vincentwho. Walk-in registrations will be accepted 30 minutes prior to the event. Cost is $12 and includes refreshments. For more information about the film, please visit www.vincentwhomovie.com.